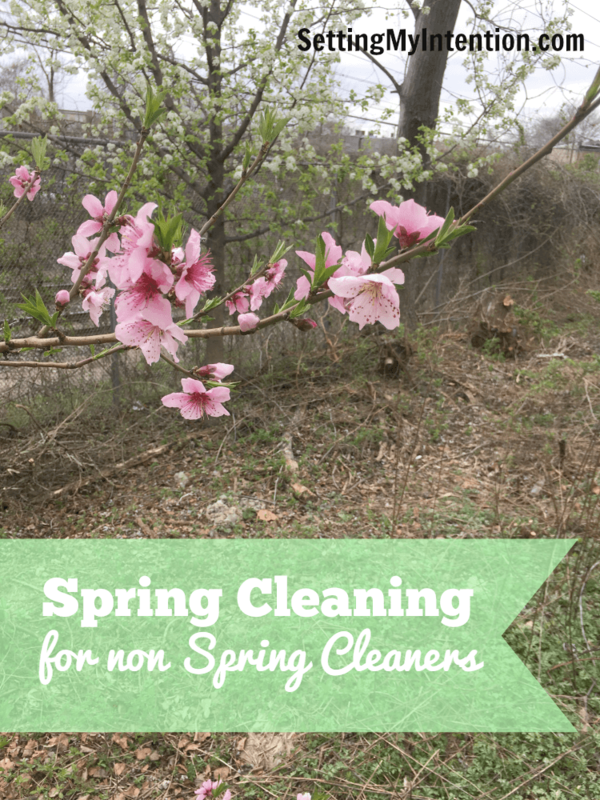 Have you guys seen all the wonderful Spring Cleaning Checklists? They are inspiring, detailed and organized…and completely overwhelming to someone like me. It’s not that my house doesn’t need a good thorough cleaning – it’s just that I feel paralyzed at all that entails. So I’ve decided to do Spring Cleaning in Steps. The first step for my house is to put all the winter gear away. 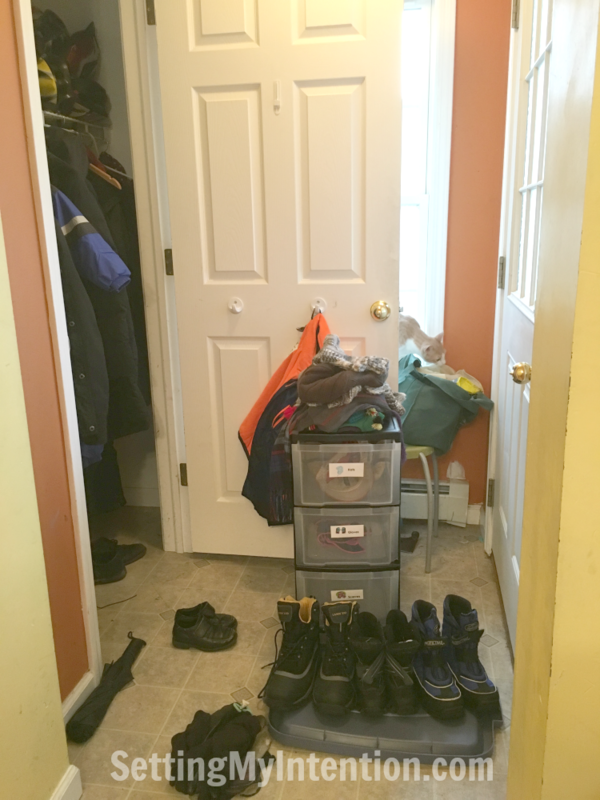 One of the first places that I decluttered last year was our entryway and the closet. It made such a difference since the entryway is small. A little bit of clutter in this space is a big headache. It’s the launching pad for our mornings. Our middle son usually tucks his shoes under the storage bench, which drives me crazy, but I kind of understand why he does it. He knows exactly where they are – even though that’s not where I prefer them! Time to unstuff the closet. The weather has been beautiful here lately – occasionally chilly but definitely past the snow pants and winter boots stage. Our spring cleaning in baby steps number one was to get the winter gear out of the closet and in storage. I pulled all the winter coats, boots, hats, scarves, and mittens/gloves out of the entryway. I washed all of the above. I removed everything from the entryway and closet floor, swept, wiped the area down, and put everything back. 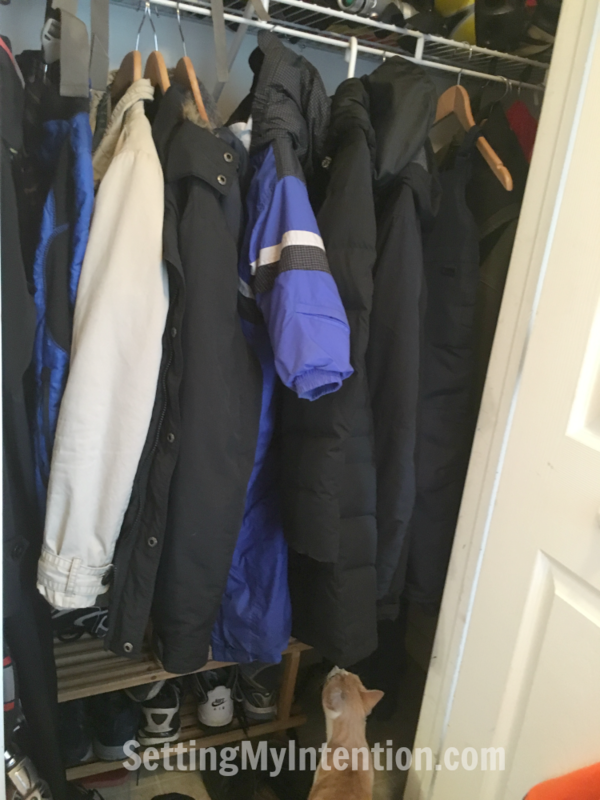 I hung the winter coats in a second floor closet – easily accessible if needed, but out of the way! 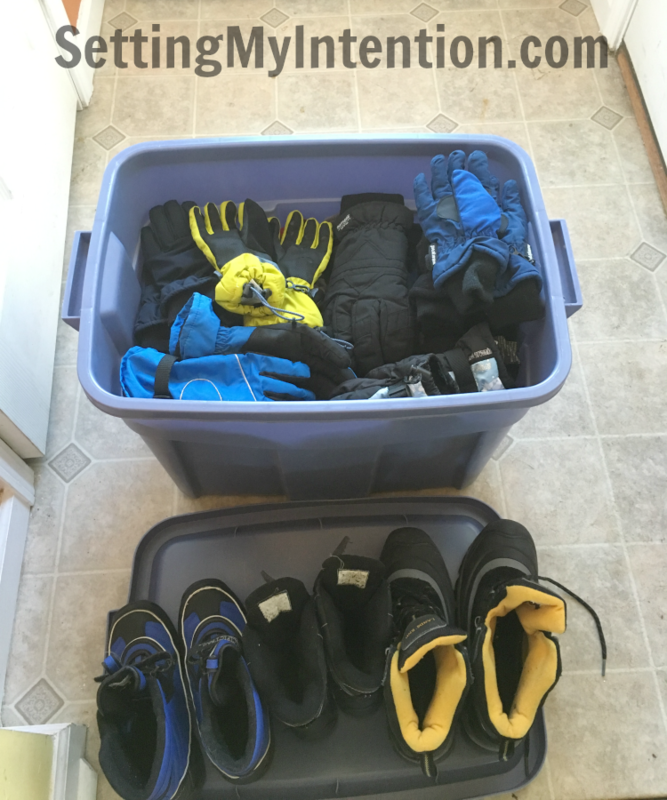 I stored all the snow pants, scarves, hats and mittens/gloves in our winter plastic tote. I moved the plastic tote up to our third floor closet until next winter. Winter coats gone! We can actually see our shoes now. If you have similar feelings of being overwhelmed, but want a clean home, I encourage you to pick one baby step in spring cleaning too. If you haven’t put your winter gear away yet, maybe that could be one of the first too! This post will be shared at these awesome link ups. Here in Mississippi every time I start putting my winter clothes away and start using my opened toe shoes…the weather changes and it gets cool enough making it impossible to do the whole swap!!! I am so ready for that Spring cleaning!!! I waited so long to switch but then the weather turned on us too! The snow pants and gloves weren’t needed though – just the coats! It’s funny that you say that Yarikza because the day after I packed our winter gear away – the temperature dropped about 30 degrees and we needed our warmer coats! I like this idea. We are going to be doing some decluttering this weekend, and I think we will start with all the coats. I am tired of reaching for my jacket and knocking five coats of the hook! I know the feeling Jill! We had to pull out our winter coats again so our closet is feeling full again – at least they’re clean though! thanks for this cleaning inspiration! I really need to get on it! We just finished that switch as well. It feels so nice to have that clean entryway again. Once I had that put away we each tackled our closets – putting away sweaters and the heavier winter clothing. I think now I’ll tackle my kitchen. I find that the little stuff accumulates over the winter – like storage containers and utensils. Happy Spring Cleaning! Thanks Victoria! You are so right about how little things build up in the kitchen cupboards. That may be another area I need to tackle. 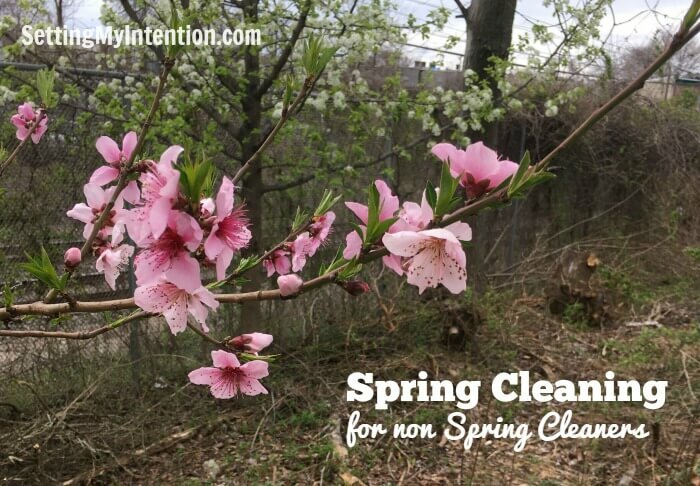 Happy Spring Cleaning to you as well! That’s great Dee! Thank you for hosting! My hallway always seems to be full of stuff that shouldn’t be there but a few weeks ago we purchased a shelving unit just for footware and now I’ve at least got somewhere to put them. I am envious of your lovely cupboard. Containers make such a big difference don’t they? 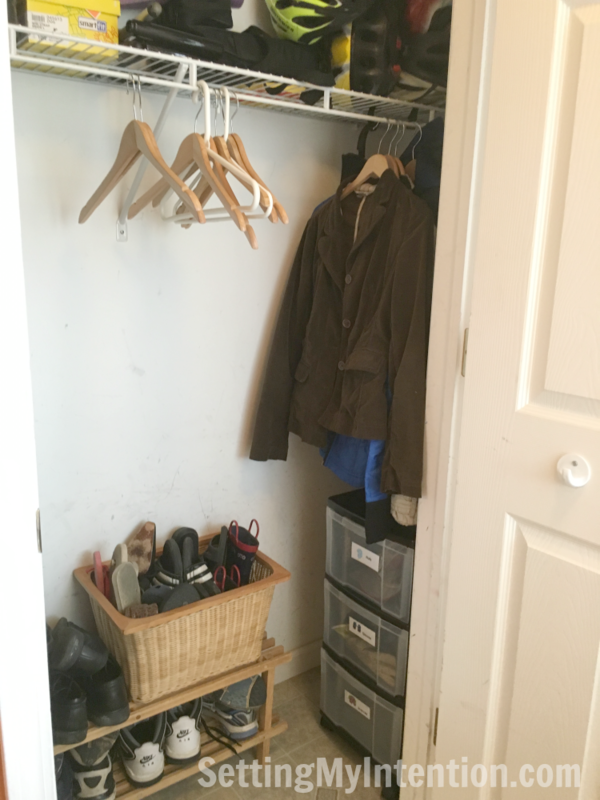 I think I’d go batty without our closet – it’s a narrow and small entryway, but decluttering it has made all the difference!